The Kunstverein ist currently closed due to construction work. The Kunstverein is suitable for visitors with wheelchairs or baby carriages. The entrance is barrier-free. An elevator is available inside the building. The Heidelberger Kunstverein is located in the center of the old town. The entrance is through the Kurpfälzische Museum / Palais Morass in the main street / pedestrian zone. or on foot from the central square Bismarckplatz, which can be reached by all lines. Here you can find the timetable information of the Rhein-Neckar transport system. 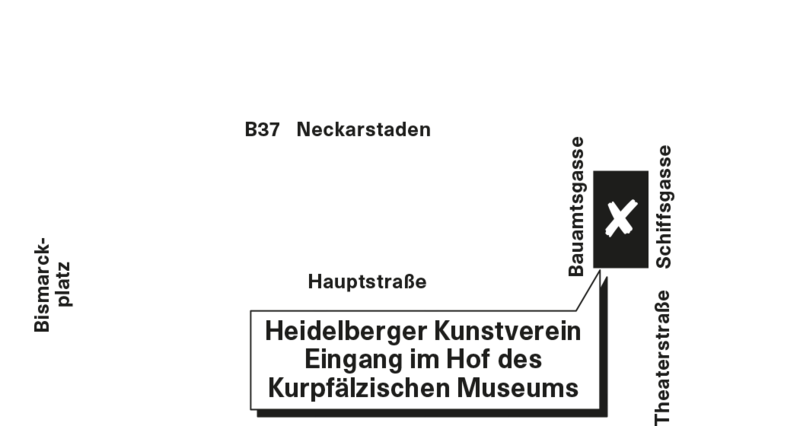 The parking garage Kongresshaus / Stadthalle (P8) is located very close to the Kunstverein. The parking garage Kraus (P6) is only a five-minute walk from the Kunstverein away. Members of the Heidelberger Kunstverein and other art associations affiliated to ADKV have free admission to the exhibitions and public guided tours of the Heidelberger Kunstverein. The same applies to members of ICT and holders of the ICOM card.